Fatima Jinnah Medical College (FJMC) Lahore Admission 2014 Fatima Jinnah Medical College (FJMC) Lahore Admission 2014 for Bachelor of Medicine, Bachelor of Surgery (MBBS). Saida Waheed FMH College of Nursing Lahore Admission 2013 Saida Waheed FMH College of Nursing Lahore Admission 2013 for B.Sc. (Hons.) Nursing affiliated with Fatima Memorial Hospital Shadman Lahore, Khairun Nisa Hospital Faisal Town Lahore, Hijaz Hospital Gulberg Lahore. 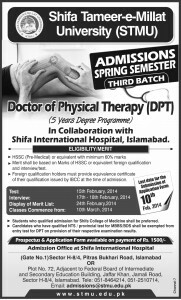 Johar Institute Of Professional Studies Lahore Johar Institute Of Professional Studies (JIPS) Lahore for Doctor of Physical Therapy (DPT), Doctor of Pharmacy (Pharm-D), M.Phil Pharmacology.